Would you like to practice Yoga with ease every moment of your day, instead of trying to find time and fit it in your hectic schedule? How about bringing awareness towards your every action and reaction? Kriya Yoga helps you achieve total awareness of your every action – without trying. You are in charge of your “self” and feel totally in control of every situation. When life throws you a curve ball, you are ready to handle with ease, comfort and minimal effort. 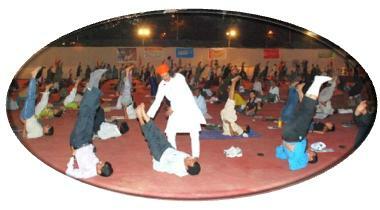 Yoga is just not postures – it comprises of eight limbs of which the postures are just one limb. Healing Therapy – Mudras are hand gestures that help regulate the flow of Prana (life force energy) in the meridians (nadis). This helps relief from all minor to major health problems like acidity, headache, sinus, high blood pressure, constipation, heart problems and soon. Kriya Yoga is a scientific method of harmonizing and synchronizing the natural forces and energizing one’s being. The purpose of Kriya Yoga is to transform your whole life into a continuous expression of joy, bliss and wisdom. We offer individual and group classes. We can also travel to teach Yoga at different organizations, yoga studios and private homes.